The maximum declarable fuel capacity for tech log, nav log, etc is 16,200kgs for 3-Tank Classics, 20,800kgs for NG's and up to 37,712kgs for BBJ's depending upon how many tanks the customer has specified (max 12). The AFM limits are higher, but not normally achievable with standard SG's. 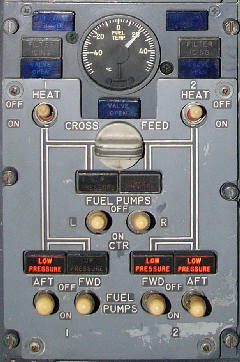 The fuel panels for the various series have not changed much over the years. The NG's have separate ENG VALVE CLOSED & SPAR VALVE CLOSED lights in place of FUEL VALVE CLOSED. The -1/200 panel also has blue VALVE OPEN lights similar to that on the crossfeed valve. The FILTER BYPASS lights were FILTER ICING on the 1/200. 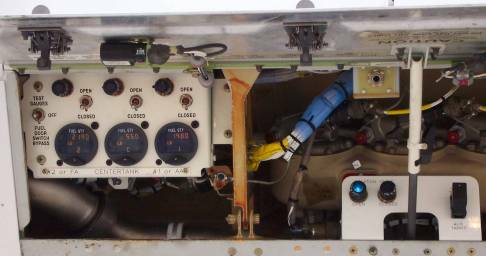 The 1/200's had heater switches; these used bleed air to heat the fuel and de-ice the fuel filter. They were solenoid held and automatically moved back to OFF after one minute. NG: The engine spar valves and APU are normally powered by the hot battery bus but have a dedicated battery to ensure that there is always power to shut off the fuel in an emergency. The total tolerance for the FQIS system is based on a full tank. 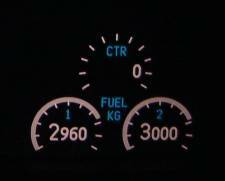 For example, if the fuel tank maximum capacity is 10,000 KG, then the tolerance of the gauging is 0.03 (airplane with analog indicators) * 10000 = 300 KG. The system tolerance is then +/- 300 KG at any fuel level within the tank. The accuracy of the fuel flow transmitter is a function of the fuel flow. At engine idle, the system tolerance can be 12%. During cruise, the tolerance is less than 1.5%. The fuel flow indication is integrated over time to calculate the fuel used for each engine. 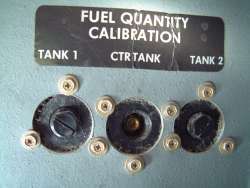 The total tolerance for the FQIS system is based on a full tank. For example, if the fuel tank maximum capacity is 10,000 KG, then the tolerance of the gauging is 0.02 (airplane without a densitometer) * 10000 = 200 KG. The system tolerance is then +/- 200 KG at any fuel level within the tank. The accuracy tolerance of the fuel flow transmitter is a function of the fuel flow. At engine idle, the system tolerance can be 12%. During cruise, the tolerance is less than 0.5%. 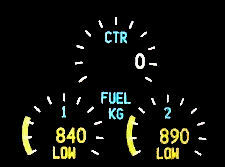 The fuel flow indication is integrated over time to calculate the fuel used for each engine. 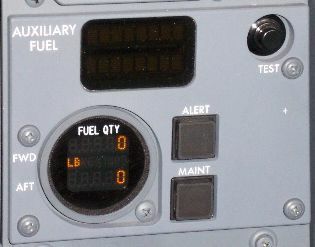 On the Digital Sunburst fuel gauges, pressing the "Qty test" button will start a self test of the display and the fuel quantity indicating system. After the test, each gauge will display any error codes that they may have. Note: The gauges are still considered to be operating normally with error codes 1, 3, 5 or 7 on the Simmonds gauges or error codes 1,3 and 6 on the Smiths gauges. ie If the gauge is indicating (rather than zero) the gauge may be used. Error Code Fuel Quantity Indicator Reading Probable Cause Gauges considered to be operating normally? 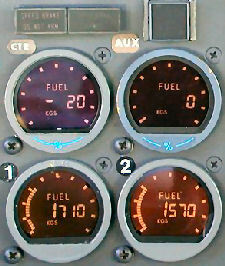 If a fuel gauge is u/s the quantity must be determined by using the dripsticks (floatsticks in later aircraft). The classics have 5 dripsticks in each wing tank and none in the centre tank. The NG has 6 dripsticks in each wing tank and 4 in the centre tank. Because of cumulative errors it is recommended that the wings are filled once every few sectors to ensure an even fuel balance. In-flight, the GW must be periodically updated to ensure the accuracy of VNAV speeds, buffet margin and max altitude. There are two AC powered fuel pumps in each tank; there are also EDP’s at each engine. Both fuel pump low pressure lights in any tank are required to illuminate the master caution to avoid spurious warnings at high AoA’s or accelerations. Centre tank LP lights are armed only when their pumps are ON. 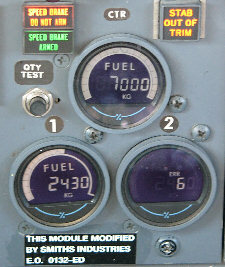 Leaving a fuel pump on with a low pressure light illuminated is not only an explosion risk (see Thai and Philippine write offs) but also if a pump is left running dry for over approx 10 minutes it will lose all the fuel required for priming which will render it inoperative even when the tank is refuelled. If you switch on the centre tank pumps and the LP lights remain illuminated for more than 19 seconds then this is probably what has happened. The pumps should be switched off and considered inop until they can be re-primed. On the 1-500's, the centre tank pumps are located in a dry area of the wing root but on the NG's the pumps are actually inside the fuel tank (see photo below). 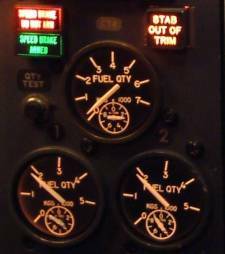 This is why only the NG's are affected by AD 2002-19-52 which requires the crew to maintain certain minimum fuel levels in the center fuel tanks. You can see the location of the centre tank pumps on the forward wall of the wheel well on the NG's, since the forward wall is actually the back of the centre fuel tank. Note: for aircraft delivered after May 2004, centre tank fuel pumps will automatically shut off when they detect a low output pressure. Originals: Only fitted after l/n 990 (Dec 1983). Operates the same as the classics. Classics: Switching both centre tank pumps OFF will cause the centre tank scavenge pump to transfer centre tank fuel into tank 1 for 20 minutes. NG's: The centre tank scavenge pump starts automatically when main tank 1 is half full and its FWD pump is operating. Once started, it will continue for the remainder of the flight. NB On the classics, when departing with less than 1,000kg of fuel in the centre tank, an imbalance may occur during the climb. This is because the RH centre tank pump will stop feeding due to the body angle so number 2 engine fuel is drawn from main tank 2, while engine 1 is still drawing fuel from the centre tank. When this “runs dry” the scavenge pump will also transfer any remaining centre tank fuel into main tank 1, thereby exacerbating the imbalance. The APU uses fuel from the number 1 tank. If AC power is available, select the No 1 tank pumps ON for APU operation to assist the fuel control unit, especially during start. 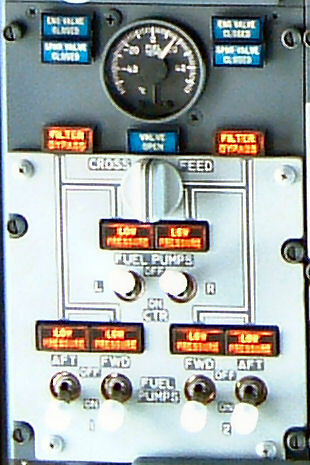 Newer –500 series aircraft have an extra, DC operated APU fuel pump in the No 1 tank which operates automatically during the start sequence. The APU burns about 160Kgs/hr with electrics and an air-conditioning pack on and this should be considered in the fuel calculations if expecting a long turnaround or waiting with pax on board for a late slot. Limitations: Max fuel temp +49ºC, Min fuel temp -45ºC or freezing point +3ºC, whichever is higher. Typical freezing point of Jet A1 is -47ºC. If the fuel temp is approaching the lower limits you could descend into warmer air or accelerate to increase the kinetic heating. Fuel temp is taken from main tank 1 because this will be the coldest as it has less heating from the smaller hydraulic system A. A fuel sampling and testing kit is kept on the flight deck of all aircraft to test for water. The standard number of fuel tanks is three. Classics could be fitted with an auxiliary fourth tank which was controlled from the main panel as shown at the top of the page. 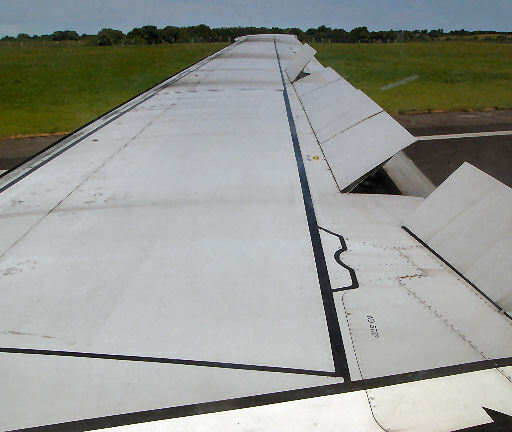 The 737-200Adv could also be fitted with an auxiliary tank at the forward end of the aft hold; these were available in either 3,065 or 1,421 litre capacities. The BBJ can have up to 9 aux fuel tanks giving it a maximum fuel quantity of 37,712kgs (83,000lbs) although in practice this would probably take you over MTOW if any payload was carried. This fuel would give a theoretical range in excess of 6200nm. 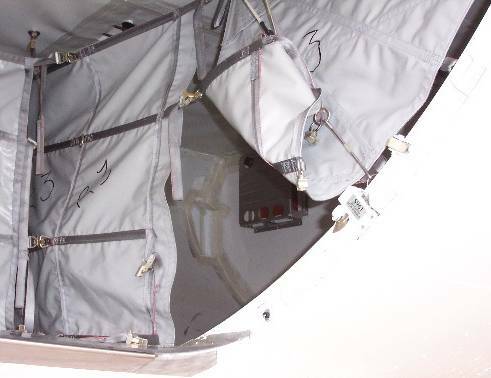 The aux tanks are located at the rear of the fwd hold and the front of the aft hold, this reduces the C of G movement as fuel is loaded and used. 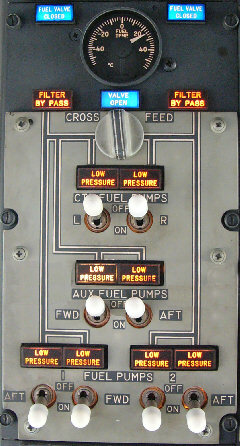 Refuelling of the aux tanks is done by moving the guarded switch in the refuelling panel to AUX TANKS. The controls for main tanks 1 and 2 change to aft aux (AA) and fwd aux (FA) respectively. The aux fuel system is essentially automatic. It works by transferring fuel from the aux tanks into the centre tank where it is then fed to the engines in the normal way. 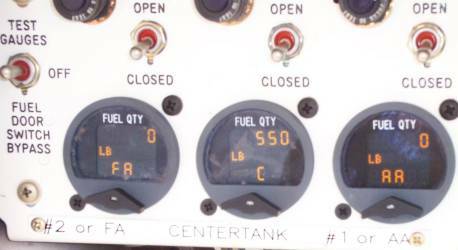 Flight crew can select fwd or aft tanks but normal practice is to use both to maintain C of G balance. The fwd and aft tanks are switched off when the ALERT light illuminates on the main panel. There are no pumps in the aux fuel system. Cabin differential pressure (and bleed air as a backup) is used to maintain a head of pressure in the aux tanks to push the aux fuel into the centre tank. The 737-200 had provision for a ferry kit. This comprised a 2,000 US Gal (7,570 litre) bladder cell which attached to the seat tracks of the passenger cabin. The fuel was fed to the centre tank through a manual valve by cabin pressure. To date, two 737's, 737-400 HS-TDC of Thai Airways on 3 Mar 2001 and 737-300 EI-BZG operated by Philippine Airlines on 5 Nov 1990 have been destroyed on the ground due to explosions in the empty centre fuel tank. The common factor in both accidents was that the centre tank fuel pumps were running in high ambient temperatures with empty or almost empty centre fuel tanks. Even an empty tank has some unusable fuel which in hot conditions will evaporate and create an explosive mixture with the oxygen in the air. These incidents, and 15 more on other types since 1959, caused the FAA to issue SFAR88 in June 2001 which mandates improvements to the design and maintenance of fuel tanks to reduce the chances of such explosions in the future. These improvements include the redesign of fuel pumps, FQIS, any wiring in tanks, proximity to hot air-conditioning or pneumatic systems, etc. 737s delivered since May 2004 have had centre tank fuel pumps which automatically shut off when they detect a low output pressure and there have been many other improvements to wiring and FQIS. But the biggest improvement will be centre fuel tank inerting. This is universally considered to be the safest way forward, but is very expensive and possibly impractical. The NTSB recommended many years ago to the FAA that a fuel tank inerting system be made mandatory, but the FAA have repeatedly rejected it on cost grounds. Boeing has developed a Nitrogen Generating System (NGS) which decreases the flammability exposure of the center wing tank to a level equivalent to or less than the main wing tanks. The NGS is an onboard inert gas system that uses an air separation module (ASM) to separate oxygen and nitrogen from the air. After the two components of the air are separated, the nitrogenenriched air (NEA) is supplied to the center wing tank and the oxygenenriched air (OEA) is vented overboard. NEA is produced in sufficient quantities, during most conditions, to decrease the oxygen content to a level where the air volume (ullage) will not support combustion. The FAA Technical Center has determined that an oxygen level of 12% is sufficient to prevent ignition, this is achievable with one module on the 737 but will require up to six on the 747. On 21 Feb 2006 the Honeywell NGS was certified by the FAA after over 1000hrs flight testing on two 737-NGs. Aircraft from l/n 1935 (Aug 2006) to 2006 were delivered with basic provisions for NGS and more comprehensive provisioning up to l/n 2019. Full production cutover is scheduled for l/n 2620 onwards. 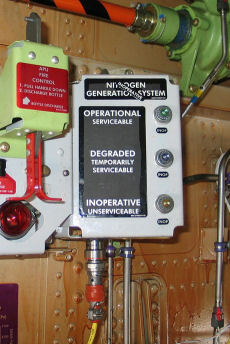 The NGS requires no flight or ground crew action for normal system operation and is not dispatch critical. A series of aircraft flight and ground tests were performed by the Federal Aviation Administration and the Boeing Company to evaluate the effectiveness of ground-based inerting (GBI) as a means of reducing the flammability of fuel tanks in the commercial transport fleet. Boeing made available a Boeing 737 for modification and testing. 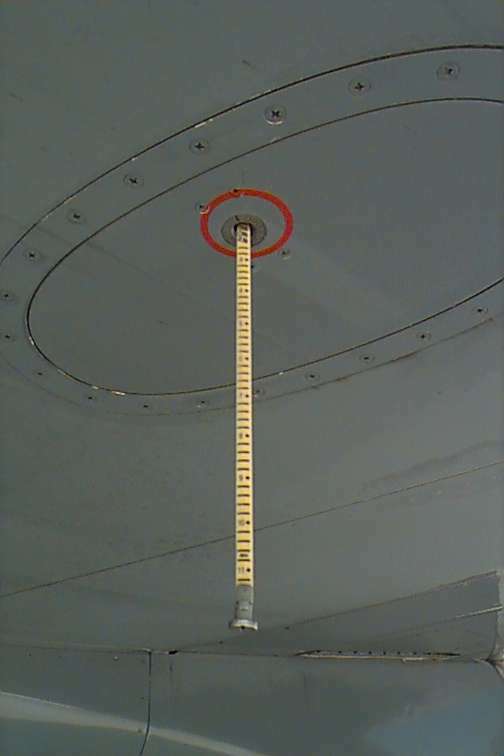 A nitrogen-enriched air (NEA) distribution manifold, designed, built, and installed by Boeing, allowed for deposit of the ground-based NEA into the center wing tank (CWT). The fuel tank was instrumented with gas sample tubing and thermocouples to allow for a measurement of fuel tank inerting and heating during the testing. The FAA developed an in-flight gas sampling system, integrated with eight oxygen analyzers, to continuously monitor the ullage oxygen concentration at eight different locations. Other data such as fuel load, air speed, altitude, and similar flight parameters were made available from the aircraft data bus. A series of ten tests were performed (five flight, five ground) under different ground and flight conditions to demonstrate the ability of GBI to reduce fuel tank flammability. It was demonstrated under the most hazardous condition-an empty center wing tank-that GBI would remain effective for a large portion of the flight, or until aircraft descent. However, it was also shown that the dual venting configuration of some Boeing airplanes would have to be modified to prevent loss of inerting at certain ground and flight cross flow conditions. For ground operation, centre tank pumps must be not be positioned to ON, unless defuelling or transferring fuel, if quantity is below 453kgs. Centre tank pumps must be switched OFF when both LP lights illuminate. 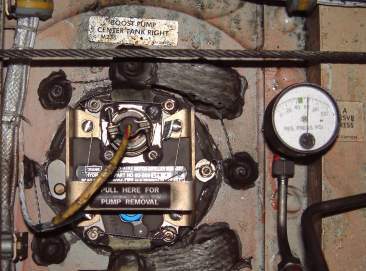 Centre tank pumps must not be left ON unless personnel are available in the flight deck to monitor LP lights.